Grandson of the amazing and infamous Joss Whedon, Zack Whedon takes his grandfather’s original and phenomenal web-series, Dr.Horrible, and brings it to comics in a successful and enjoyable manner. 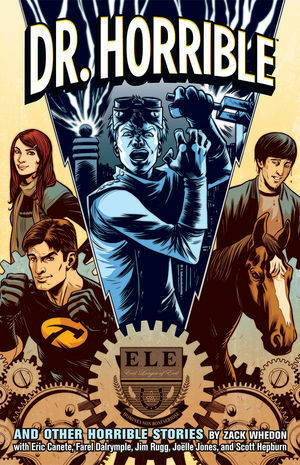 Serving as a collection of several single issue releases, Dr. Horrible and Other Horrible Stories houses a whole lot of fun and a more in depth look at the characters involved. I love the art in this issue. It reminds me a lot of Randy and Jean-Marc Lofficier’s work in The Blue Amazon. It is sketchy, disproportioned and eye-catching as hell. It brought a great feel of whimsy to this Captain Hammer tale and made this an issue worth reading. The story in this issue is also outstanding. I really loved Hammer’s character in the web-series and seeing him brought to life in the pages of this comic made my heart swim. I will be just like you any day, Hammer. Meet Moist, in case you haven’t seen the show, he is a man that is abnormally, well, moist. 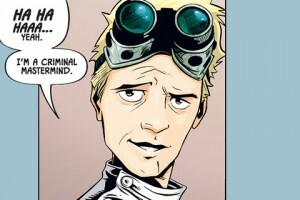 Rejected and unable to act as a proper contributor to society, Moist joins the ranks of Dr. Horrible. After seeing who would soon become his leader be beaten down by Captain Hammer, Moist lends a helping hand that will change his life forever. This issue is the reason I purchased this collection to begin with. As much as I would have likely bought it without this story, I would have been gravely disappointed in the lack of Penny. Luckily, that is not the case and even more fortunately, this Penny focused issue adds a lot of emotion to the series. Nothing makes me happier than knowing she was just as into Dr. Horrible as he was her. Moreover, the art by Jim Rugg is great. After seeing his work on The Guild series I quickly fell in love with his simplistic and cartoon style that carries Felicia Day’s appearance and ambience perfectly. Bad Horse and his Evil League of Evil receive a gift in the form of a mass hero vacation and they will stop at nothing to destroy as much of society as they can before the superheroes return. When a man named Johnny Snow attempts to foil their plans he accidentally completes them more successfully and becomes a villain in the eyes of all those watching. Having grown up bullied due to his lacking size and overly large brain, Billy quickly realizes that all those who exceed his weight capacity will always take him for a weak fool. The repercussions of this realization form the mad-man he would soon become. Of all my expectations of this book, this issue had the highest. When you take a character as loved as Dr. Horrible and attempt to give them an origin, it often times comes up unsuccessful. That isn’t the case for this story, however. 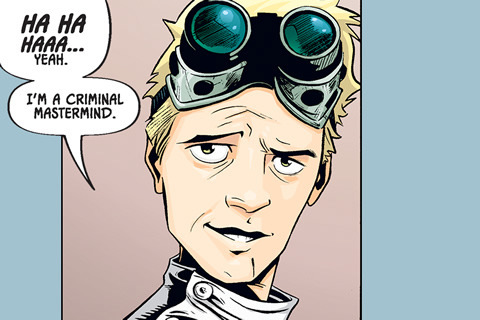 The means by which Billy becomes Dr. Horrible are logical and relatable, leaving you with a strong feeling of sympathy and forgiveness for his actions. Overall, this trade is a gem. What Zack has done with these characters is successfully create a believable and creative back story for them and I couldn’t be happier! There is nothing I love more than a good media cross-over and this has proven to be one of my favorites. 4/5. It’s a grand ol’ time.